The reality is that it’s hard to build a business from scratch. You need the right people, the right product, the right timing, and more often than not, a lot of luck. But even those things don’t guarantee success. At Segment, we’ve had the incredible and unlikely fortune of building a real business in those exact conditions. We launched the very first tiny slice of our product 6.5 years ago as a Show HN post. We still have an enormous distance to go on our journey. However, today is an important milestone. We’re announcing that we’ve raised $175M in Series D funding. It’s a big moment for us, and one that wouldn’t have happened without the support and feedback from all of our users. Like every startup journey, we’ve had our share of ups and downs. In this post, we wanted to give you a window into Segment's journey in that first year; from the initial product launch, to our first hundred customers, to the pitch deck we used to raise our first funding. For all the startups out there in a similar boat, hopefully you can take something from our experience and apply it to your own. Six years ago, we were just four engineers sitting in an apartment on Russian Hill in San Francisco. We had 6 months of runway, and paid ourselves almost nothing. This is the story of our first year after launching on HN. Let’s start in December, 2012. At the time, the four of us had been working on failed ideas for 18 months. We had 9 months of runway left. December 2012: 6 product iterations later, nothing was working. We were trying to decide between a group trip planner and what eventually became Segment. It was a dark time. We realized we had only one last shot. So we decided to open source a library we’d built to send our analytics data to all of the different analytics tools (including our Mixpanel competitor) via a single API. Papering over these different APIs seemed like an almost trivial problem… but one that had clearly annoyed us enough to write some code to solve it. We debated internally for 5 days whether this weekend project was actually a viable business. We kept going round in circles, coming up with arguments for and against the idea. Try as we might, we couldn’t come to a consensus. We were blown away. We’d finally hit a real problem - but whether we could build a business remained to be seen. We had put up a landing page at segment.io to test whether users wanted a hosted version. We told them to leave their email and then we’d get back to them. It was minimal — all it did was host Analytics.js for users. They could turn on any of our 10 integrations, enter their configuration, and we would render a custom version behind a Cloudfront CDN. We’d also collect these events via our Node API, and show the events in in a dashboard, but there wasn’t any data actively being proxied through our servers. The winter holidays were the first time we’d consistently had a steady stream of traffic on our API. We were seeing tens of requests per second come in around the clock. We came back in January and started going “all in” on Segment.io. We pitched a few different press outlets to finally announce that we had been funded by YC. We were fortunate enough that TechCrunch wrote about our story. Spurred on by our early user adoption and attention from press, we next turned our focus towards building features. The most valuable thing we ever did at this stage was enable livechat via Olark. It gave us an unparalleled window into what users were asking for. Unlike our earlier ideas, we were now getting constant feedback on the product. People would start using the product and then just kept asking us for more. It was an invigorating feeling for us. Instead of making vague guesses at what users might want… they told us outright! Throughout that time, we only had one medium to announce our products: our blog. We had no real press contacts, no analyst relations, and we certainly didn’t have any money to buy ads. While publishing on our blog certainly helped us get the word out about what we were building, there was one problem with it. Back then, analytics was a relatively new concept for many companies. It wasn’t enough to just talk about features; we needed to help businesses understand the most effective ways to use them. To help answer this question, we launched Analytics Academy. Analytics Academy was our first foray into trying to create our own content marketing. We launched it over email to our users (as well as launching it on HN). The premise was simple. 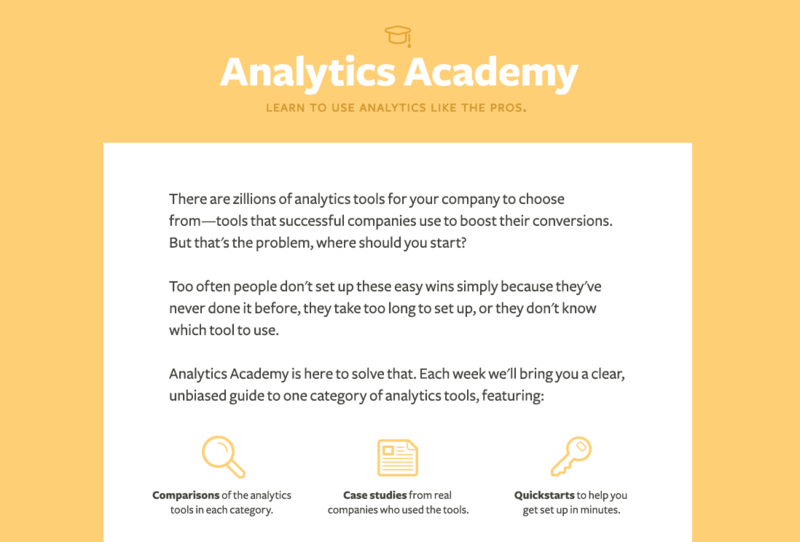 Each week, we’d release a new lesson promising to take you from zero to analytics expert. We hoped that it would be a good way to spread all of knowledge we’d gained from working in the analytics ecosystem for the past year. Once again, it seemed like we’d hit on something that people wanted! The whole analytics ecosystem was confusing… there were hundreds of different vendors… and our content seemed like it could actually teach our users something. The trouble was, it didn’t seem like our content was landing. We weren’t seeing it get re-shared, and the posts didn’t seem to resonate. It all felt lame compared to our earlier success on the blog. Ilya (one of the four of us) sent a draft post to his brother, Mike, who runs his own bootstrapped startup to ask for his feedback. The question is, do I feel I learned something unique/valuable from this article? I didn’t think so. Can you guys give me something valuable here? - Which chat products are better at what? / how are they different? - How do you deal with chat volume? - What are some best ways to use the customer feedback? Bottom line, give me some juicy knowledge that (a) puts me at ease with adding live chat and (b) gives me specific techniques for benefiting from it. He pointed out that the Academy posts had piqued his interest… but not really delivered on their core goal: to teach him about analytics. We set out to do better with the next posts. For each one we focused on a set of specifics. Things that he could immediately take away to help his business. That lesson has really stuck with us ever since. It’s been our goal for everything that goes on our blog that the content should be both specific and actionable. We ended up publishing six different tutorials, from dashboarding to live chat and email tools. It wasn’t easy, but now the academy is still one of our most popular pieces of content to date. Despite our first taste of success in product-market fit, we started to hit some serious problems. In May, our funding was starting to dry up. We still hadn’t started charging for the product, and we were looking at about three months of runway. We set out to raise $1m as part of a bigger seed round at an $8m valuation. We had public pricing on our site, promising traction and a lot of momentum, but we were still pre-revenue. Peter was doing the fundraising, and reached out to all of the investors on our radar. Of the dozens of emails we sent, 3 replied. Among them were e.Ventures and KPCB. To give you an idea of where the business was at, I’ve included the full set of slides from our 2013 “Series Seed” pitch deck down below. Following the advice of YC, we included: 1) extremely clear descriptions of the product 2) the relevant pre-revenue metrics 3) a set of ideas for the future. We started with a simple description of the product, and a few screenshots to give investors a grounding in what Segment does. At its heart, Segment is a technical product, so explaining what it does and how it works is key. We’d just launched our mobile libraries a few weeks before, and we were riding off the momentum of our new releases. Next came our growth numbers. The primary metric that mattered to us was the number of new projects (our name for sources at the time) sending data. Our pricing was based upon data volume, and each new project would be paying us at least $10 a month. The charts shown in the second slide were the ones that we were looking at week over week. Oddly enough, instead of using an analytics tool (we use Mode over Redshift today), we had hooked up a Google sheet. We’ve always loved being able to look at the raw data. The top left graph shows the number of active projects sending data. You can see that it grows linearly, sometimes dipping on weekends when the smaller projects sent no data. The bottom left graph shows the percentage of signups who are actually creating a project (the first step in our funnel). The bottom right graph shows the percentage of projects that actually get to the point of sending data. We put these up on a dashboard in our apartment and monitored them religiously. You can see where we fixed our signup flow to ‘auto-create’ projects about two weeks in, and steadily started seeing higher levels of activation. Since we didn’t have much (read: next-to-zero) revenue to speak of at this point, we thought ‘social proof’ would be better. This last slide became pivotal when we later went to raise our Series A, though looking back on it, we realize how cheeky it was to include at the time. As we made it clear to investors, none of these companies actually used Segment at the time. They had all expressed interest, and the intent of things they wanted to do. But we hadn’t convinced any of them to actually use the product. Segment was here to stay. 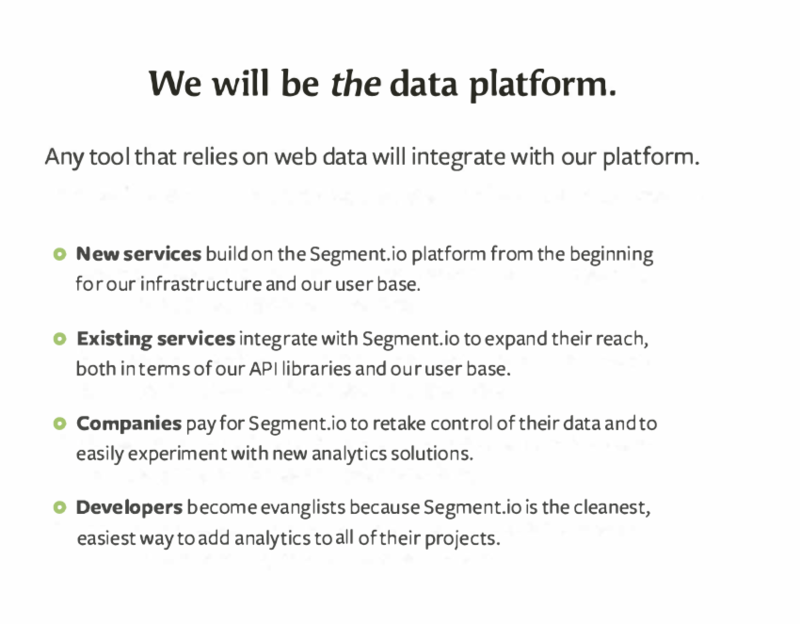 To really drive the point home, we included a few slides positioning ourselves in the market, how we might monetize, and spelled out the benefits of using Segment. What’s changed the most today is how we monetize. Back then we thought revenue sharing with partners might be a good idea, but that ended up being a small revenue stream and a conflict of interest in advising customers on the best tools, so we no longer practice revenue sharing with our partners. Instead, we only receive revenue from our customers. We no longer charge for premium integrations either. We realized quickly that users get the most value from Segment when they integrate more tools. Making users think twice before enabling an integration felt like it was hurting our customers and ourselves more than it helped. Of course, we wanted to share a few of our ideas for the future. Building a simple way to integrate different tools felt like step 1 for Segment. We saw our bigger path forward as creating the platform for customer data. We eventually integrated with 2/3 of these companies (we never got the chance with Amiato, who was acquired by Amazon). With the launch of our Developer Center last month, this promise has become more and more of a reality. Since that time, we’ve added 180 integrations. In the past month alone, we’ve added 25 new integrations, all built atop Segment Data. Finally, we explained our ambitions: to be the infrastructure that lets you manage your customer data. As we’ve grown, this pitch has been largely consistent. Segment is the place to send your first-party data. We closed $2M in new funding from e.ventures and KPCB, which gave us the necessary runway to make it through the next year, and blow past our first milestone of $1M in annual recurring revenue. Here’s the email Peter sent to Ray, our partner at KPCB, just after the round closed at $2m raised on $10.5m post-money valuation. We began hiring for engineering, customer success, and sales that November. And we had our first annual contracts booked in November 2013. We grew from 4 to 10 people that year, and set ourselves on the road to scaling. Since those early days, Segment has grown enormously. we’ve expanded the Segment platform and grown our integrations catalog from 8 integrations to more than 250.
our users now enable over 80,000 new destinations over the course of the year, which equates to one integration enabled every 1.4 minutes of every workday. released a number of widespread open source tools: nightmare, evergreen, metalsmith, kafka-go, ksuid, and chamber. That said, some things haven’t changed. Our blog is still our primary avenue for launching product. We keep open-sourcing our internal tools to share with the community. We keep reading every HN comment and tweet about the business. And we continue to share what we’ve learned. Most of all, we’ve just kept trying to build momentum and create value for our customers. Not all of our bets have panned out. But as long as we continue to make bets, some of them will. In the past 6 years, we’ve gone from 8 integrations to more than 250. This year, we are focusing on expanding on that number in a major way. We’ll be continuing to provide more powerful ways to integrate via our developer center, and continuing to onboard new partners into the Segment ecosystem. This month alone, we’ve added 25 new partners integrated with Segment. We’ve heard the feedback that our pricing can be expensive for early-stage, high volume, consumer-focused startups. We’ve already taken a first step to address this with our startup program, which gives away two years of Segment for free. And as we speak we’re working with startups all over the world to figure out a pricing structure that will work better for them. Our renewed goal this year is to “give you superpowers”. We have a number of products in our pipeline that should give you unparalleled ways of managing your data pipelines, all without changing your tracking code. Advanced filtering, workflows, and privacy products are coming down the pipeline. On a more personal note, we want to thank everyone who has been along for the ride. To this day, the four of us still re-forward 5-year-old emails from our earliest users and customers. Your excitement about the product gave us the conviction to keep building. Without you, Segment would have been another failed side project. With your help, we’re now able to help thousands of business provide world-class experiences for their customers. And tomorrow, we’re looking forward to helping tens of thousands more.